PF-SR Sealant Remover is a heavy duty, residue free, high flash point solvent based cleaner and degreaser for surface cleaning of gross soils, sealant and adhesive residues, fabrication soils and marking inks during Aerospace MRO & OEM parts cleaning operations. PF-SR is also an effective cleaning solvent in preparing and cleaning tooling of composite structures. 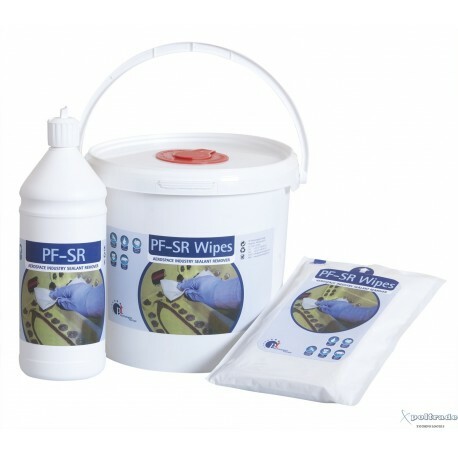 PF-SR Sealant Remover is available in liquid and impregnated (pre-saturated) wipes with a low lint cloth that is compliant to AMS 3819C and BMS 15-5F Standard. Pre-saturated wipe system eliminates the hazardous storage, transport and logistic issues of loose flammable liquids. This is a demonstration of surface cleaning using PF-SR Sealant Remover solvent cleaning wipes.